Last night, I had the pleasure of attending the Opening Preview for Paris Photo LA on the backlot of Paramount Studios. This was my first time attending this celebrated international photographic art fair, but I had an inkling that the two hours allotted for the reception wouldn’t be nearly enough time to adequately peruse the offerings of the fair – and I wasn’t wrong. With several studio stages filled with booths and Paramount’s NYC Backlot transformed into a neighborhood of galleries, there is more art to see than could be achieved in one day. Here are my “First Impression” winners to look out for, if you plan to attend the fair. Russian photographer Nadav Kander, represented by Flowers Gallery of London (Booth 7), caught my eye with his image, “Priozersk XIV (I Was Told She Once Held an Oar)”. Kander, who is intrigued and inspired by secrecy, used Google Earth to “fly over” the former Soviet Bloc to locate abandoned Soviet military testing sites. Kander believed these secret locations, shrouded in mystery, ought to be exposed for the world to see. The weight of the history there is palpable in this image of war-torn Kazakhstan. Yet, as sinister as the content may be, this photograph is a thing of beauty. The sign of a true artist, Kander was able to recognize and capture a diamond in the rough. I was also drawn to works by Arden Ellis Surdam, whose works can be found at the J.P. Morgan booth (16). 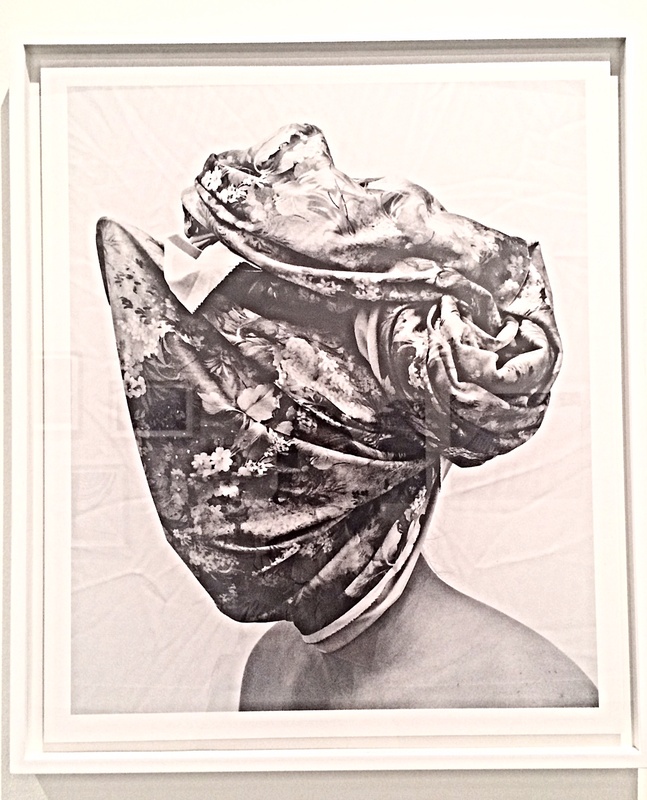 Surdam’s gloriously creepy photograph of a misshapen head wrapped (or is it hidden?) under a floral turban stopped me in my tracks. The photograph, for me, perfectly personified a feeling of attempting to distract the world at all costs when I’m feeling grotesque; usually by overcompensating with accoutrements that hardly reflect how I feel inside and only serve to highlight my ill at ease. Swiss artist Rachel Rom’s seductive photography also gave me pause at Parisian Galerie E.G.P’s booth (6). I met Rom, who explained that she attempts to inject life into photography, which she sees as morbid and still, by constantly building upon her images so that they might evolve – as do humans. 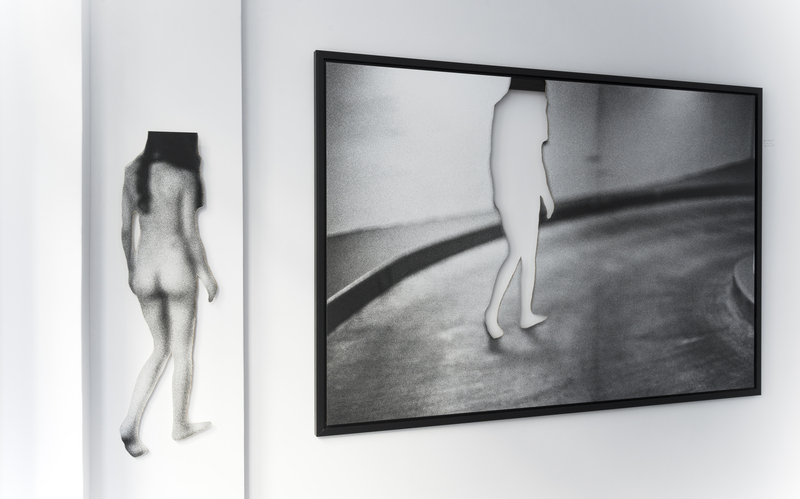 For instance, the “Fragments” series of vintage images of her mother at age 30, re-photographed by Rom when she was also 30 and pregnant with her first child, was an exercise in experimenting with rephotographing pre-existing images to “renovate” them. No series of her photographs are ever shown in the same way, so her work evolves with every exhibition, becoming more and more complex as time goes on. 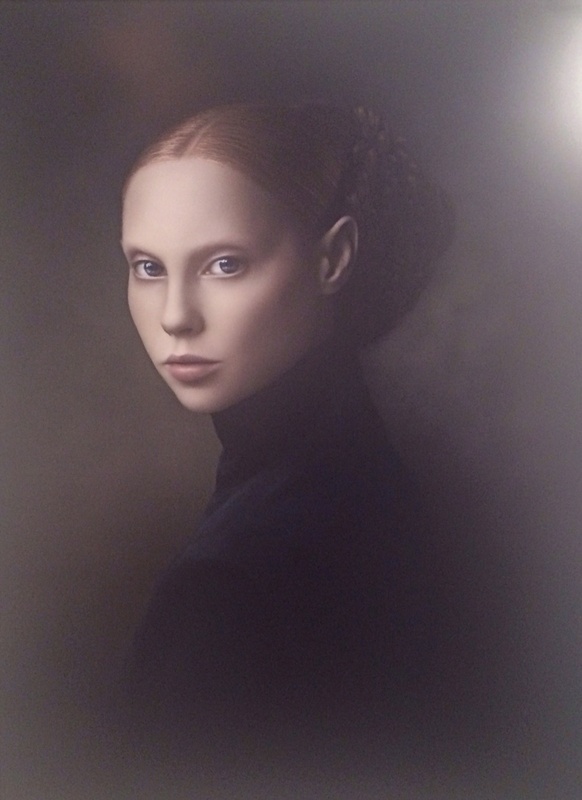 And finally, as I ambled toward the exit of the NYC backlot, the perfect cherry on the top for the evening was an impressive showing of portrait photographs by Dutch artist Desiree Dolron, from Grimm Gallery in Amsterdam (C6). 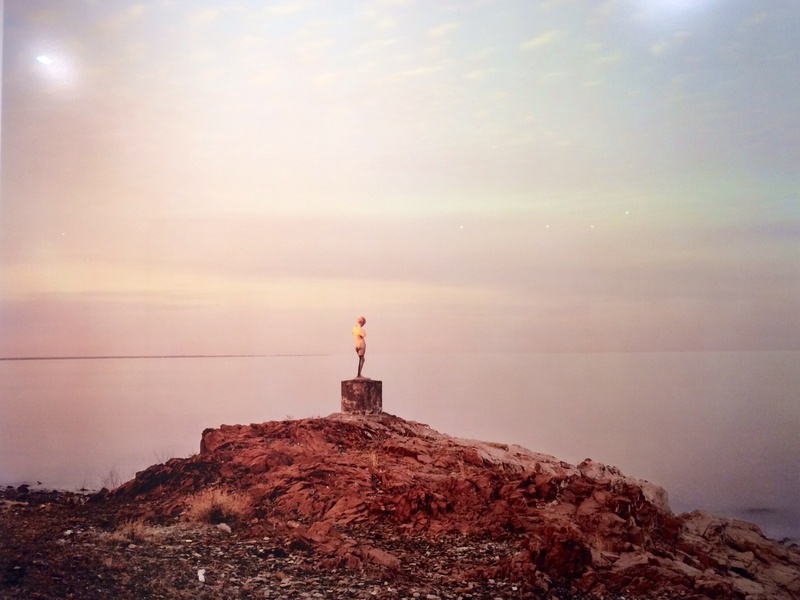 The series shown at Paris Photo LA this year, “Xteriors,” is based on a reoccurring dream from Dolron’s childhood. 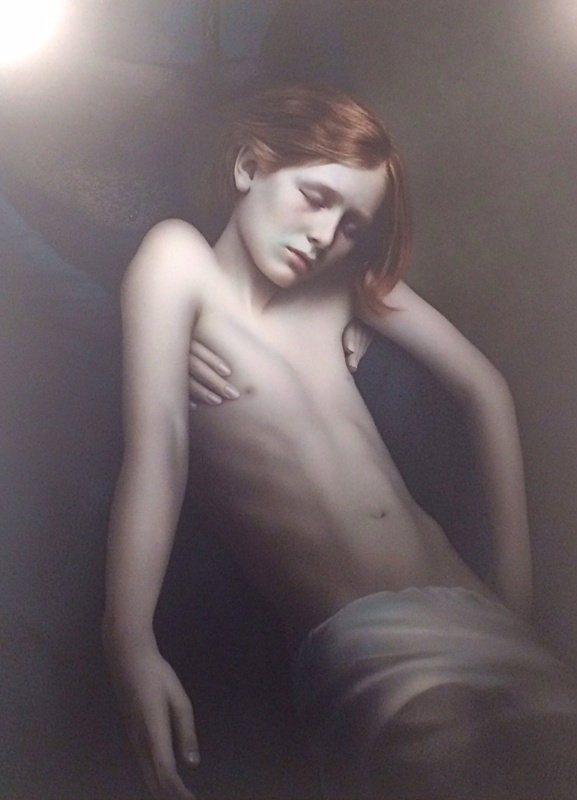 Dolron, a redhead, often projects herself into these images by assigning her models auburn hair. These hypnotizing portraits were shot in the same location, a cohesive thread that ties the portraits together, to tell a mysterious story just beyond our understanding. Paris Photo LA runs Friday, May 1 – Sunday, May 3, 2015.